I don’t understand why so many people are opposed to everyone having health insurance and decent medical care. My mini-vacation from school is over. Classes start up again tomorrow. Some dude tried to pick me up in Best Buy. He had on a red beret. I bought a wristlet the other day. Love it! Thanks to TM, I’m considering a shopping ban in February. I don’t like being solicited over the phone, even if it is the blood bank. Smoochy has been eating much better and exercising regularly. I am thrilled! I read a lot of J.ames P.atterson. The weather has been absolutely beautiful – 72 today, I think. Every time I remark on how great the weather is I think about my Grandma and smile. I wanted to muzzle the lady who was two machines over from me on the elliptical – why was she grunting and sighing like she was bench pressing 400 pounds. Shhhhhh….be quiet! I took the kiddo to see the C.hipmunk movie on Monday. I think I enjoyed it more than she did. I saw The B.lind Side on Tuesday. Blech. I love both my new rice cooker and immersion blender. I can’t believe I am so late to the game. When I think about my life this far I get a little verklempt. I am glad to be me. Thinking about painting our bedroom a deep, burnt orange. We seem to own exactly one tablespoon and about three teaspoons. Where is my silverware??? I think all politicians should follow NY Governor P.aterson’s lead and just admit to their affairs before they take office. I’m on a mission to use up all of my random and sundry body washes and lotions before I buy any more. I’ve got more random bottles than the law should allow. My new favorite quote? “Every day is the best day.” Yeah, that’s courtesy of the kid. My current ringtone is “My H.ood” by BG. I have no explanation. 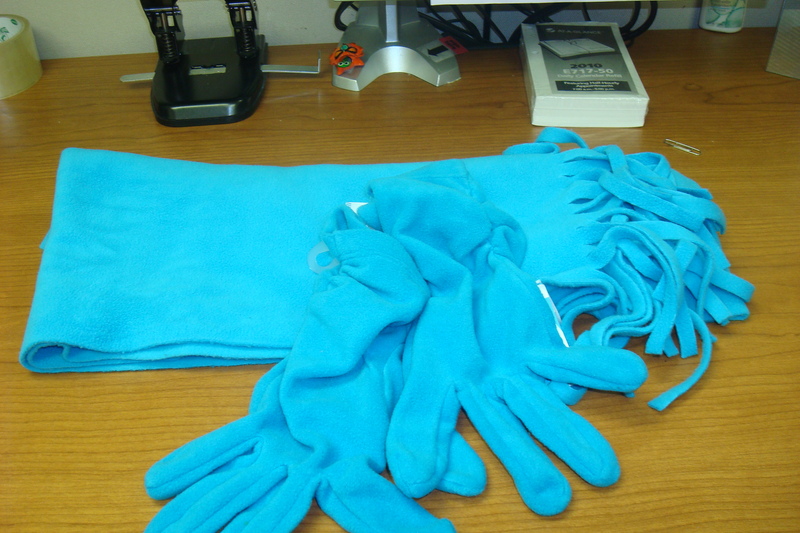 This is the scarf and glove set I got from She Needs for the Secret Santa exchange. WordPress had been tripping and I am just now able to upload pics again. 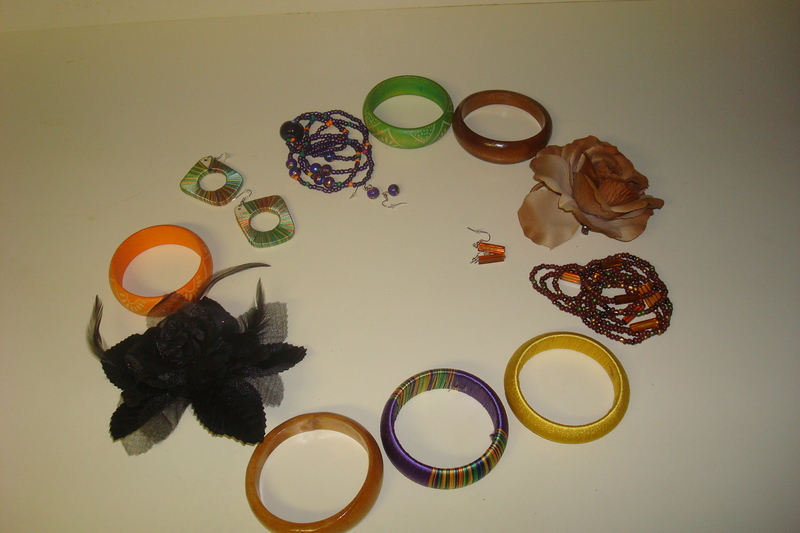 This is my stash from the dollar jewelry store. Most of this won’t be worn until spring and summer hit. This entry was posted in All Things Beauty, Blogroll, Books, Lovegirl, Photos. Bookmark the permalink. About the spoon thing, with a yougin’ they may be throwing them away. After replacing a few, i finally figured out what was going on. I may have to join you and TM on that no shopping thing. I have been spending like crazy lately. I’m blaming the youngin’ and her daddy! I really do think I’m going to only shop for groceries and true household necessities next month. LOL – watch me buy up a bunch o’stuff in the next two weeks! I stopped reading James P when he started letting them other folks write his books and he just slapped his name on them. Me no likey. I don’t think I’ve read any that he had a coauthor on. I read mostly the Alex Cross series – did somebody else write those? Say it aint so! At least it wasn’t a raspberry beret, LOL! I won’t ask….you know I was singing rasperry beret in my head right?!? Your parents are in Costa Rica. I’m jealous. That means no dollar jewlery store in February either! I think you’re the first person that I’ve heard say they didn’t really like The Blind Side. You have a rice cooker AND immersion blender? That’s what I requested for Valentine’s Day. I think I’m jealous. We have a burnt orange wall in our living room- it’s pretty! At one point my parents had no silverware, my daddy was throwing it away when he was cleaning his plate over the trash can. He never even noticed. Every day is the best day is a great quote! I’m going to post that on my monitor right now! I bought cheapies from WalMart, but so far, so good. I refuse to watch the chipmunks movie. The commercial almost drives me batty, I could not sit through it. Your parents are the bomb! I wonder what happens to our spoons, too. Not the forks, just the spoons. It’s like the socks and the dryer thing. Burnt orange and chocolate would be the business! I’m considering those colors for the upcoming fall nuptials. I can’t believe I’m saying this…it was a cute little movie. The voices didn’t annoy me the way I thought they would. I’ve not read too much J.ames P.a.tterson since he started writing with someone else….I loed all the Alex Cross books and some of the others, but, wasnt’ feeling the first one I read where he co-authored so I’ve not tried anymore! Ditto. I just happened to glance over at my bookshelf when I was writing this post and I noticed how many JP books I had. But I am not into the co-author thing at all. The kind you find in a second hand store…. Bwahahahahaha I’m sorry but that song started playing in my head right after I read that sentence. So what was his pick up line? I’ve been doing pretty well regarding shopping since the holidays have passed. Let’s see how long I can keep it up. Note to self: Stay away from clearance racks and stores that house them. I had to eat cereal yesterday using a toddler spoon. Hope your first day of classes went well. Oh, me too. It was all I could do not to let out a Prince shriek when he walked up to me! Basically he spoke the truth – that I was the most stunning creature (yes, creature) he’d ever seen and that my husband was a lucky, lucky man. Who can argue with such? LOL! Clearance racks and wonderful sales have been my downfall lately. mayhaps your parents would like to adopt me and take me on their globetrotting trips. not at all interested in ‘the blindside.’ it’s gorgeous here, too!! low-mid 70s? FTW!! i don’t buy lotions and potions because they accumulate and who can ever use them up? pas moi. plus i love the smell of soap– on me preferably oil of olay. Ooh costa rica … beats this yucky chicago weather- although its actually bearable right now . I currently have about 10 showergels , more sprays and more lotions than I know what to do with , so I too told myself that I couldnt buy any more until I use some up or throw some away . And we currently have about 6 forks and 3 spoons , idk where the silverware goes , maybe the same place my missing socks are ?